This chapter is not a Subversion Tutorial. It focuses on the integration of Subversion with Tuleap and how to use it in an optimal way in this context. If you are not familiar with Subversion we warmly advise you to first read some of the documents listed in the references section (see Subversion References). It is important to note that a version control tool like Subversion is just a part of the overall configuration management activity. Therefore, Subversion alone does not constitute a complete configuration management solution for your project. Depending on the maturity of a project, the project may have specific policies regarding the use of the software baseline or the integration of bug fixes, etc. The Subversion tool may allow you to enforce some of these mechanisms but project managers should make sure that these policies are documented, maintained and well understood by all project members. For example, a project may wish both to commit changes daily to avoid loss of work, and to also insure that the baseline is always unit tested code. Since the end of the day may arrive before the code or unit tests are complete, a single baseline cannot accommodate both uses, so the project may opt to use Subversion branches. Don’t worry if you do not initially know enough to write the final configuration management policy for your project - this always tends to evolve as the project matures - but do communicate regularly with the project members and improve your configuration management plan on a regular basis. 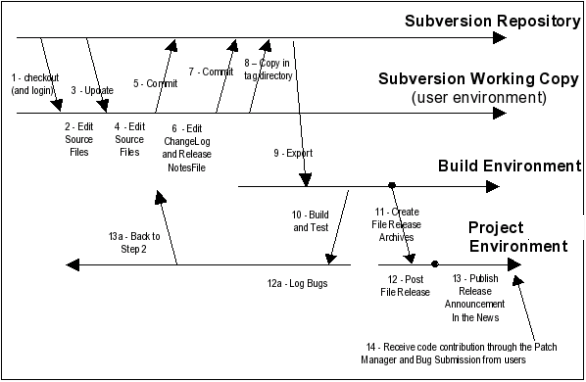 Subversion is an Open Source version control system that manages your files and directories history over time. The Subversion effort started in early 2000 under the leadership of Karl Fogel, a recognized guru of CVS and author of the so-called ‘CVS Black Book’(see Subversion References). Like millions of developers in the world, Karl had used CVS for years and acknowledged the fact that, in spite of its merits, it had a number of shortfalls that would be nice to fix. From the very beginning the Subversion team, sponsored by the CollabNet company, clearly stated that the goal was not to produce a revolutionary version control system but rather to build on the strengths of CVS and wipe out all of its weaknesses. As a result, like CVS, Subversion belongs to the family of concurrent version control system. It means that a team of multiple developers can concurrently manage their own version of the same source code and gracefully merge the changes brought to the software by the various team players. Directory versioning: because CVS relies on the native file system of the machine it runs on it has been impossible to implement the versioning of directories. Subversion implements a “virtual” filesystem stored in a database that tracks changes to the entire directory and file tree. True version history: moving and renaming files in a CVS repository has some limitations mainly due to the fact that versioning is attached to individual files. With Subversion you can add, delete, rename and copy files or entire directories without doing any compromise on the file naming or the file history. Atomic commits: although Tuleap provides an additional layer on top of CVS which gives an atomic view of the commits, CVS itself has no notion of the fact that you may have committed a dozen file at the same time to fix a single bug. Subversion on the contrary stamps the entire tree with a new revision number each time you make a change. Versioned metadata: Subversion can attach any number of properties (in the form of key/value pairs) to files and directories. Properties are themselves versioned like the files and directories they are attached to. Various access protocols: Like CVS, Subversion offers a choice of network protocols to access a subversion repository. It can be a local file system access or a network access through the Subversion own’s lightweight protocol (svnserve) or a secured remote access through SSH. Additionally and more importantly, Subversion can be accessed through the WebDAV protocol which is an extension of the HTTP protocol. This has a number of advantages like the ability to run all transactions through secure HTTP, go through firewalls and take advantage of the HTTP authentication methods. Efficient diff’ing: when you create a working copy on your desktop machine, a complete version of the original file is kept on your disk which allows developers to perform status and diff operations even when working offline. Efficient branching and tagging: in Subversion these 2 operations are performed by literally copying (all or part of) the repository. The copy is virtual in the sense that the virtual filesystem establishes hard links to indicate from which revision the copy comes from. As a result branching and tagging takes a very small amount of disk space and, above all, it takes a constant amount of time regardless of the repository size. Fine grain access control: in its Tuleap incarnation, your Subversion repository operates on top of the HTTP (or HTTPS) protocol and it therefore take advantage of the rich HTTP authentication mechanism. As a result Tuleap allows you to fine tune who has access to which part of your Subversion repository whether for read, write or no access at all. Extensibility: like CVS, Subversion comes with a number of facility to hook custom processing at the various stage of a commit operation (pre-check, post-check,etc.). Unlike CVS, Subversion comes with well documented library APIs with bindings available for several languages like C/C++, Java, Python and Perl. Subversion has a client-server architecture. In other words, Tuleap developers who want to interact with the Subversion repository of their project must have Subversion installed on their desktop machine, hereafter called client. The Tuleap server permanently runs a Subversion server in the background to which Subversion clients talk to to act upon the Subversion repository. Subversion clients come in various flavors for all sorts of platforms (Windows and all Unix): command line interface, graphical based interface and web based interface. Subversion comes with a command line interface that can be used on virtually any platform (Linux/Unix, MS Windows, Mac…). Even though Subversion has multiple command line options, most commands that you normally use have one or two command-line options and are very easy to remember and look a lot like cvs commands. Refer to Subversion References for more information about how to use the Subversion command line. Subversion already has a number of graphical front-ends. rapidSVN is part of the standard Subversion package and runs on Linux and Windows. TortoiseSVN is another option for MS Windows users. jSVN is a Java based client that can run on any platform. As time goes the list of graphical front-ends will certainly grow. Refer to Subversion References for more information about those graphical clients. As mentioned above, rapidSVN is the graphical user interface that comes with Subversion for Linux and Windows. Below are all the instructions needed to get rapidSVN running on a Tuleap project. In the instructions below, “username” is the Tuleap user login name, and “projectname” is the Tuleap short project name the user is working on. Download rapidSVN from the Subversion Web site and install it on your PC. Click on the new bookmark corresponding to your repository and type you Tuleap user name and password when asked to. You should now be able to browse the repository and see the file status and revision history. When the dialog box pops up, type the same URL as above and choose where you want your working copy to be created. A second bookmark corresponding to the new working copy should now appear in the bookmark pane on the left hand side of the screen. On the right hand side appears the list of files and directories of your working copy along with their revision number and status. From there use your favorite editor to modify the source code, hit the refresh button in rapidSVN to see modified files and commit your changes when your are done. The Subversion Book. See http://svnbook.red-bean.com). The Official Subversion Web Site. See http://subversion.tigris.org/ This is where you’ll find the subversion software including the rapidSVN client. TortoiseSVN. A graphical MS Windows and Linux graphical client. See http://tortoisesvn.tigris.org/. jSVN. A graphical 100% Java graphical client. See http://jsvn.alternatecomputing.com/. Whenever a new project is hosted on Tuleap, a new Subversion repository is automatically created and properly initialized. Each project has its own Subversion repository as opposed to what happens in most Subversion servers, where several projects share the same repository. Having its own repository has a certain number of advantages: the Subversion logs, history files, and all administrative files (e.g. hook scripts) are unique to each project repository. This allows you to fully customize the behavior of Subversion for a given project without impacting the others. All interactions with a Subversion repository should normally happen through a Subversion client. However if need be and if this feature is available on your Tuleap server, you can get access to your Subversion repository via your Tuleap shell account (see Shell Account). Once the shell session is active you’ll find your subversion repository under /svnroot/projectname you should never do that unless you know exactly what you are doing. When a new Tuleap project is created, it comes with a virgin subversion repository that the project team must populate. Due to the fact that Subversion manages branching and tagging through its virtual filesystem (and not through labels attached to individual files as in CVS) there is a recommended way to organize your repository. The layout suggested below can be considered as a de-facto standard and we highly recommend that you follow this best practice. where /trunk contains the main line of development, /branches contains branch copies and /tags contains tag copies of your source code that generally correspond to a given release. More on the repository layout is available in the Subversion book listed in Subversion References. Tuleap offers a number a facilities that allow you to interact with your Subversion repository through the Web interface. The Subversion Web interface does not intend to replace the Subversion client that you should normally use on your desktop computer. It rather focuses on providing you with additional features not found in Subversion clients. Accessing the Subversion repository: The welcome page of the Tuleap Subversion service gives you all the information you need to access the Subversion repository from your Subversion client. Among other things it tells you what the Subversion root path is and how to checkout the source code. This page may also be customized to display project specific instructions (see Subversion Administration Interface). Browsing the Subversion repository: this feature allows you to browse the Subversion repository even if you don’t have a Subversion client installed on your desktop machine. Querying Subversion: If the Subversion tracking feature has been activated for your project all Subversion events (commit, file addition or deletion) are tracked down in the Tuleap database. This audit trail can be searched using several criteria. Subversion Administration: this service allows project administrator to perform the most common Subversion administration and configuration tasks from the Tuleap Web interface (for more details see Subversion Administration Interface). Let’s review some of these features in more details. In order to interact with the Subversion repository of any Tuleap-hosted project, you normally need to have Subversion installed on your machine. However Tuleap also offers a built-in Web browsing interface to the Subversion repository which allows you to navigate in the source code, download it, view a file history or compare two revisions of the same file. Atomic Subversion commit and unique commit ID: all changes (file modification, addition or removal) that are committed in one go from your Subversion client are assigned a unique commit ID also known as a Subversion revision number. Commit cross-referencing: the unique commit ID (or revision number) generated at each commit can be referenced in future commits, or in the follow-up comments of project artifacts like bugs/tasks/support requests simply by using the pattern commit #XXXX, or revision #XXXX or even rev #XXXX (where XXXX is the unique commit ID). Any reference of that kind will be automatically transformed into an hyperlink to the Subversion tracking database. This mechanism makes it very easy to go from project artifacts like bugs, support requests or tasks to source code changes and vice-versa (more on this mechanism at Cross-Referencing Artifacts and Subversion Commits). Commit search: another side benefit of the Subversion Tracking database is that you can use various search criteria to query the Subversion tracking database. You can search code changes by authors (who made the change), by revision number, by file path or by keywords to be found in the log message. Results can also be sorted by clicking on the headers of the search results (see Querying the Subversion tracking database of a given project). A click on one of the selected commit ID brings you to a complete description of the change, the files that were impacted and the nature of the change with a direct link into the Subversion repository if you want to browse the file or look at the code modification (see The detail of an atomic Subversion commit). While working in the development or the maintenance phase of a software project, it is vital to keep track of the changes made to the source code. This is what Version Control systems like Subversion do. In addition to keeping track of the source code change history it is often critical to relate the changes to the artifact (a task, a defect or a support request) that led the developers to make a change in the code. And conversely, when reading the artifact description it is also very helpful to immediately see how the change was implemented. The integration of Subversion in Tuleap precisely provides Tuleap users with this bi-directional cross-referencing mechanism. This is achieved through the use of reference patterns that are automatically detected by Tuleap in either the follow-up comments of the project artifacts or in the messages attached to a Subversion commit. revision #YYY or rev #YYY: this pattern refers to the commit YYY where YYY is the commit revision number. When browsing a message containing this pattern anywhere in Tuleap, the pattern will be automatically transformed into an hyperlink to the commit description which include log messages, impacted files, versions and author of the change(see The detail of an atomic Subversion commit) . It is considered a best practice to always reference a bug, a task or a support request in any of the log message attached to a Subversion commit. Similarly when closing the related artifact (task, bug,etc.) make sure you mention the revision number in the follow-up comment. You will find this extremely convenient while trying to keep track of the changes and why they were made. 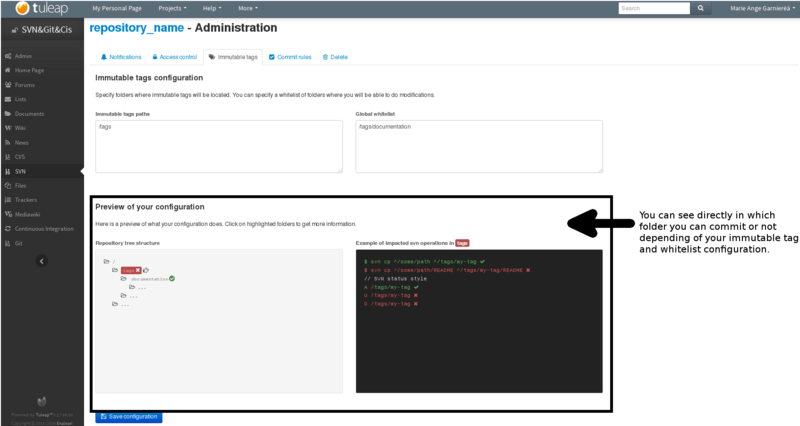 Through the Tuleap Web interface, project administrators can perform the most common administration and configuration tasks on their Subversion repository. The administration functions can be accessed through the SVN Admin menu item in the Subversion menu bar. Subversion Tracking: Being a version control system Subversion is, of course, natively taking care of all your file history and is able to tell you what changes were made by whom and at what date. The file history is something you can look at either through your Subversion client or through the Subversion Web Browsing interface. If you activate the Subversion tracking (default) for your project Tuleap will also keep track of all the code changes in the Tuleap database. This will give you extra capabilities on your Subversion repository as explained in Querying Subversion. Subversion Preamble: In some cases (e.g. when your project already has its own subversion server in place), the project Subversion repository might not be hosted by the Tuleap server. In this case, the Subversion information displayed in the welcome page of the Tuleap Subversion service are inadequate. Fortunately, the project administrator can customize the Subversion Information page here. Subversion access permission depends upon the project status (private or public) and the class of citizen a user belongs to (see Type of users). Regarding private projects, only project members have access to the Subversion repository. By default they all have read and write access. This can be modified by customizing access permissions as explained below. Anonymous Users: users who have not registered with Tuleap (or are not logged in) have no access at all to the Subversion repositories. Registered Users: have read-only access to Subversion repositories. In other words they can checkout a working copy of the software but they are not allowed to commit any changes they have made to the source code. Source code contributions (bug fix, enhancements…) from this class of user must return to the project team via the Patch Tracker (see ? ). Note: if the “restricted users” mode is on (See Type of users), then there is no access for non project members by default. Note: all source code accesses are recorded by Tuleap. Project administrators always have access to the list of people who accessed the source code (see Access Logs). Thanks to the integration of Subversion in the Tuleap environment, project administrators can redefine access permissions for some or all Tuleap users. path is the path to the directory or to the filename (relative to /svnroot/projectname) in your repository for which you want to redefine access permissions. name is either a Tuleap login name or group name. The name * (star) means any registered user. All project defined user groups (see User Groups) are also defined in the Tuleap default permissions settings and ready to use if you wish to redefine access permissions. permission is either r for read-only access, rw for read-write access or blank if access is forbidden. where member1,member2,...,memberN are the Tuleap login name of the Tuleap project members. Additionally, all existing user groups defined in this project are listed in this section. Note that if the user group is not defined neither in the default permission settings nor defined by the user, each permission definition for that group will be commented. Attributing permissions to a specific user or to manually defined groups could cause security issues. It is recommended that you only use Tuleap user groups to define permissions. These default permission settings are automatically generated, and cannot be edited. You should consider this section as the beginning of the Subversion permission file: project administrators can then edit additional permissions that will be added below the automatic section. Please note that it is not possible to restrict permissions already granted on the same directory. will indeed prevent registered users from reading the ‘/secret’ directory. For more information about the format of this file you should refer to the Subversion Book (see Subversion References). In addition to tracking the changes in the Tuleap database, Tuleap can also send a nicely formatted email message to individual email addresses or mailing lists each time there is a change in the source code. The email message contains the log message, the author of the change, the list of impacted files and pointers to the Subversion repository showing what changes were made. Subject Header: is a piece of text that will appear as a trailer in the Subject of all the email notifications sent to the addressees. This trailer is supposed to help the addressee to quickly spot the messages in their Inbox or to put filters in place to route the email notification to a given folder. Path: subversion path on which notification will be sent. Email addresses: a comma separated list of email addresses of people to whom the email notification must be sent can be given. If you want to notify a large group of people then we strongly advise you to create a mailing list first (see below). If you intend to generate email notification for the changes made in your Subversion repository or a specific path, it is a good practice to create a specific mailing list called projectname-svnevents. By doing so, Tuleap users and project members interested in receiving the email notification just need to subscribe to the mailing list. In addition, the Tuleap mailing list manager will archive all the email messages which can prove very useful for future reference. See Mailing Lists for mailing list creation. Thanks to the integration of Subversion in Tuleap, SVN Administrators can define immutable tag paths. An immutable tag is a path where contributors won’t have right to update or delete exiting files. It is possible to define folders where you can enhance this rule and add new content by defining paths in immutable tags whitelist. As stated earlier, the intent of this chapter is not to give a formal Subversion training but rather to explain what are the steps a project team typically goes through when using Subversion and, more generally, all the Tuleap tools involved in a Software release process. It also deals with the problem of contributing source code when you are not part of a project team. In this section all examples are given in the form of Subversion command lines but transposing them to graphical front-ends should be relatively straightforward. Unlike CVS when used with the pserver protocol there is no explicit login command to issue to start working with a Subversion repository. Subversion will ask for your login name and password only when performing an operation (e.g. commit) that requires authentication. If the project allows it, you can use a token instead of your password when using SVN. First, you need to generate a token for your account. Go to you account preferences, generate a new SVN token. There’s no way to retrieve this token so don’t forget it. You can generate as many tokens as you want so if you loose one of your tokens, just delete it from you account preferences and generate another one. If the project can manage SVN tokens, just use your token instead of your password when using SVN. As the happy administrator of a new Tuleap project, the first thing to do is to populate your freshly brewed Subversion repository with your project source code. To do so, first create a new directory topdirectory on your workstation and populate this top level directory with the recommended directory layout documented earlier (see The Subversion Repository Structure). svn --username loginname import . loginname is your Tuleap login (all lowercase). The –username option is only needed if your Tuleap login name is different from the Unix or Windows login name you are currently working with. If your Subversion server is configured in secure mode, note that you should use https://tuleap.example.com/svnroot/projectname instead of http://svn.projectname.tuleap.example.com/svnroot/projectname in all the examples given on these pages. It is not unusual to make a mistake when importing your source code into a fresh Subversion repository especially for new users. Typical mistakes are directories placed at the wrong level or with the wrong name. Nothing to fear though… If you want to start again from a fresh Subversion repository contact the Tuleap Team to get your Subversion repository reinitialized. Alternatively you can easily delete or move directories and files with any subversion client afterwards. Note that if you already have a Subversion repository available, the Tuleap Team can help you migrate this repository on Tuleap and preserve all of your project history. We just need a dump of your Subversion tree generated with the svnadmin dump command. With this dump the Tuleap Team will re-install everything for you on the Tuleap server. Contact us for more information. Once a Subversion repository has been populated other Tuleap users can checkout the source code and place it on their own workstation. The result is called a working copy in the Subversion jargon. Note that ‘checkout’ in the Subversion world does not mean that the user has acquired any sort of lock on the file. The Subversion paradigm is: anyone (with the right permissions) can retrieve a working copy for editing; changes are reconciled or flagged for conflict resolution when the file is committed. Unlike other tools (RCS, SCCS, ClearCase…) Subversion is a concurrent version control system. A working copy is NOT an image of the Subversion repository. It is rather a snapshot of the source tree at some point in time and, by default, it’s the latest version at the time the working copy is created or updated. One of the interesting features of a working copy is that it is a self-contained entity. In other words, a working copy contains all the necessary information for Subversion to know exactly which Subversion server and repository it is coming from and the corresponding moment in the history of the source tree . This is also why you won’t see the URL option pointing to the Subversion repository in all subsequent Subversion commands presented here. These commands run from within a working copy, so Subversion knows exactly where the Subversion repository is. The output will show you a list of files which undergo some changes either because they were modified, added or deleted. If no filename is specified the diff operation is applied recursively on all the files and sub-directories. Project members involved in development activities will likely want to contribute the changes made in their own working copy back to the Subversion repository. In Subversion terminology this is called a commit operation. The -m option is followed by a text message explaining what changes you have made. The filenames argument is optional. It can be individual files or directories. If there isn’t any files mentioned Subversion will automatically commit all the modified files in the directory where you are located and all sub-directories recursively. In the ideal world, all modifications made to the source code of a project should be related to either a bug logged or to a task assign to a developer. If your project team lives in this wonderful world :-) then don’t forget to include the related bug or task ID number at the beginning or at the end of your commit message. The Subversion hook scripts can help you enforce this rule by checking the format of all the submitted commit messages and reject them if it does not follow the recommended pattern. If you try to commit a modified file that was also modified on the Subversion repository in the meantime, the Subversion server will refuse to execute the svn commit command. You must first execute a svn update command to bring your own working copy up to date with latest version, merge your changes with those from others (Subversion does it automatically in most cases) and then only commit your own changes back to the Subversion repository. If you want to be immune from others’ changes then create a Subversion branch and work with it in isolation. This is a variant of the previous section for those of you who do not have write access to the Subversion repository of a project and, therefore, cannot commit their modifications to the Subversion repository. The variant explained here is actually a method that is universally used in the Open Source world to contribute source code modification to the project team. It consists in the generation of a text file containing the differences between your modified version of the source code and the original one that you initially checked out. This file is often referred to as “diff file”. The reason why diff files are so popular is because they follow a well-documented format. Diff files are sent to the original project team which, upon reception, is going to use another universal tool called patch to automatically merge the contributed changes with the master copy of the source code. This is why, by extension, a diff file is also often referred to as a patch. Diff files can be generated either with the diff tool (part of the GNU tools) that is available on all platforms including Windows or directly from within a Subversion working copy. This is the preferred way when you obtained the source code by creating your own Subversion working copy. Let’s assume that you are at the top level of the working copy. In both cases, you should redirect the output of the diff or svn diff command in a text file. Compress the output file if it’s a large one and use the Tuleap Patch Tracker (see ?) to submit your patch to the project team. There is a quick and easy way to release a pre-packaged version of your source file and make it available to all Tuleap users through the File Release mechanism (see Delivery Manager). -m "Tagging the 1.4 release"
Done! Nice job…Take a break. And remember to announce the availability of your new version via the Tuleap News service (see News Service). Tuleap offers an easy to use Web interface to administrate the common settings of your Subversion repository like access control and email notification. In case project administrators want to go deeper in customizing the behavior of their Tuleap repository, they can get access to the Subversion hook scripts. In order to access those hook scripts, you must be granted the right to log into the Tuleap server with your Shell Account (see Shell Account) . If the hook scripts you want to customize does not yet exist in the hooks directory, first create them by copying the corresponding template file provided by Subversion (.tmpl extension). Then edit the hook scripts in place. If you decide to customize the Subversion hook scripts for your repository make sure to preserve the statements that could have been inserted by Tuleap in the first place. The Tuleap statements are clearly marked with a recognizable header and trailer. The Shell Account may have been deactivated by your Tuleap site administrators.